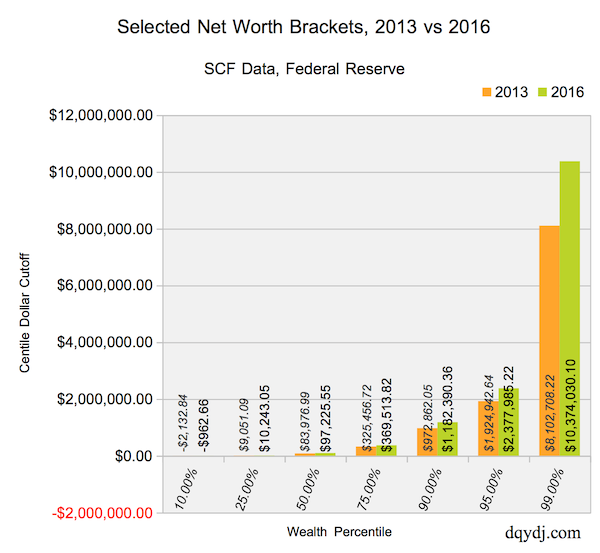 In this post, we’ll look at the United States Net Worth Brackets for 2017 (most recent data in 2019). 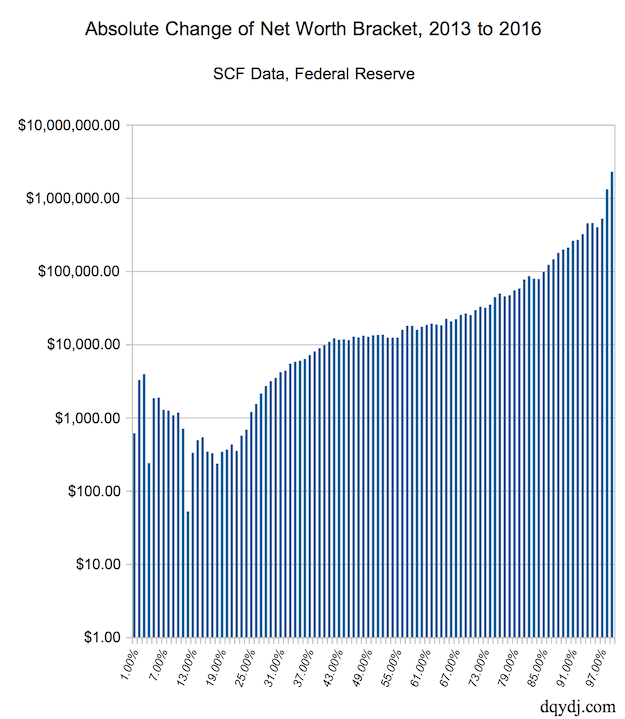 There are 126.0 million households in the United States (Federal Reserve estimate). Dollar estimates are the actual net worth quantile breakpoint – the ‘border’ between two wealth percentiles. For example, if someone had exactly $279,594.27 in wealth we’d estimate they are the 70th percentile. Net worth is a snapshot of value if you cancel out a household’s assets and debts. You can calculate your own if you add up all your assets – home to cars to accounts – and subtract your debts – mortgage, student loans, and the like. Want to track your own net worth easily? Personal Capital makes it extremely simple. Get a free account and connect all of your accounts and property, then watch your net worth over time. As a bonus, get a handle on investment fees and see all of your spending in one place. Get a free account today. We’ve selected some important net worth percentages for 2017 and 2014. This data comes from 2017 Federal Reserve Surveys of Consumer Finances, and surveys were first conducted the previous year. Stated simply, data is from wealth snapshots at sometime in 2016 and 2013, respectively. If you’d like a more exact number, try our net worth percentile calculator. We also have an individual income percentile calculator, and stats on income brackets and the top 1%. There is a lot to like in the distribution itself. Unlike the recent income percentile breakdown, every Wealth Bracket saw an improvement between 2013 and 2016. That’s right – across the board, at a percentile resolution, the wealth dollar breakpoint for all net worth brackets increased. Who Are the Top 1% By Net Worth? For the top .5% and .1% note that our estimates are hazier – consider our 95% confidence interval to be over a million dollars in either direction. Again, though, the .5% and .1% estimates are in the right ballpark of Emmanual Saez and Gabriel Zucman’s estimates for 2012 with four years of growth in between. What is the Net Worth to be Wealthy? Depending on where you live, a net worth of around $2,500,000 is wealthy. This is around the top 5% of all households in net worth, and can sustain around $100,000 in spending for 30 years. To invest in angel and private equity funds, venture capital, hedge funds, , and other private placements an investor is required to be an ‘Accredited Investor’. In the US, having net worth of $1,000,000+ not including primary home equity is the most common way to qualify. There are roughly 12.4 million accredited investor households, and around 11.3 million qualify through net worth. Investors can also qualify through individual or household income. See the math on the number of accredited investors in America. Data for this article comes from the 2013 and 2016 Surveys of Consumer Finances from the Federal Reserve. Special thanks is owed to Anthony Damico for his lodown package for R, which we are using to analyze the 2013 and 2016 datasets. Please see his Analyze Survey Data Free book which details SCF analysis and more in R.
As mentioned, the Federal Reserve estimates a representative size of 125,981,700 United States households for this survey. The 2016 survey includes 6,254 families in the private dataset. The public dataset removes 6 families (leaving 6,248) for privacy purposes. The Fed sweeps data for privacy by releasing ‘separate’ datasets with replicate weights for all the variables. Our estimates are using the linear interpolation algorithm in the svyquantile function from the R survey package. See the Analyze Survey Data book for more information; for going beyond the data you see it’s worth pulling down the dataset on your own. Other notes: net worth does not include periodic income streams such as pensions or Social Security. Perhaps a future article will attempt to account for these; watch this space, if we model income streams as net worth in the future we’ll link out. Please note the data is not longitudinal. In short, that means the surveys aren’t answered by the same families in 2013 and 2016. It’s impossible to draw specific conclusions on the net worth changes for households in 2013 households. It is, however, possible to see how the static snapshot of net worth distribution changes (or, as the case may be, for inequality measures). Some thoughts: it’s heartening to see the across the board improvements in every net worth bracket. While the broadest gains went to breakpoints on the top centiles, we saw improvement all over the map. The last three years were special in that sense, let’s hope for an even greater improvement in 2019. Now that you’ve seen the static shot, try comparing with the data dynamically. Try our American net worth percentile calculator and net worth by age calculator. You are good! Fantastic post. Thanks much for your efforts. However, there is something about these numbers that is confusing, especially when you describe the data to be in line with Saez and Zucman data. For example the entry point for top 1% and top 0.1% were $3.9 million and $20..6 million respectively ( thanks for adding the link to that article) according to Saez and Zucman but it is way way more with $10 million plus and over $43 million respectively for these groups in your data. You specifically mention these as cutoff (entry level) numbers and not the average for these groups. This is certainly not in line with Saez and Zucman. As opposed to our income posts, you should be comfortable with very big errors around wealth estimates. While the ‘actual’ 1% cutoff is likely right around that $10.3 million number, you can expect the .1% number to be off by millions in either direction. Our confidence comes from others making similar estimates in the same order of magnitude. Unless this is inaccurate, 126k individuals worth more than $43 million is quite a huge estimate. Thank you for passing the Wealth-X report along. Always good to see another datapoint. As with the other questions, let me stress to you that the numbers at the top end are hazy. While the math is correct, the Federal Reserve does remove 6 households from the full dataset because of privacy issues – and there is a very good chance the removed points were all ultra-high net worth households. As the wealth gap between families is very big up there (at the very top, as large as the gap in most of the other centiles combined!) the error is quite large. I would not be surprised if the ‘true’ number was millions of dollars away in either direction. Also, we make no individual claim – these numbers are household level estimates. How well do these replicate datasets account for these excluded (possibly ultra high net worth) households? Understand that data is hazy at the top, but inclusion of these six individuals could imply that 99.8% percentile, rather 99.9%, would be 43 million. 99.9 percentile could be much much higher as we are comparing 1 in 500 to 1 in 1000. Unfortunately we don’t have enough information to answer this, you’d have to ask someone at the Fed that has familiarity with the private set. Here is the codebook detailing the implicates so you can get a rough sense of accuracy (although I have tried to reflect the uncertainty here as well): https://www.federalreserve.gov/econres/files/codebk2016.txt ; start at the section “Imputation”. does this data include home equity, 401k and IRA account balance also? Yes, the data includes home equity and retirement accounts. If you use the net worth percentile calculator you can turn off the home equity element, but retirement accounts remain. Do you have the information on how many families have the following net worth? Percentiles of wealth does not fully explain a persons wealth position. Note that centiles are how most people search (e.g. ‘The Top Percentile’), but our net worth articles include a mix. Additionally, each centile in this post includes the breakpoints even though they are not round numbers. Does this net worth data include private business equity? does the calculation account for fully paid-up insurance policies that many wealthy families accumulate by retirement?